If I had to pick a favorite nutrient, it would be fiber. Well, technically fiber isn’t a nutrient, but that’s another story. And even though we are unable to digest fiber, it still manages to lower our cholesterol levels, feed the good bacteria in our colons, keep us going to the bathroom regularly, and keep us feeling full for longer to prevent overeating. If that isn’t amazing I don’t know what is. 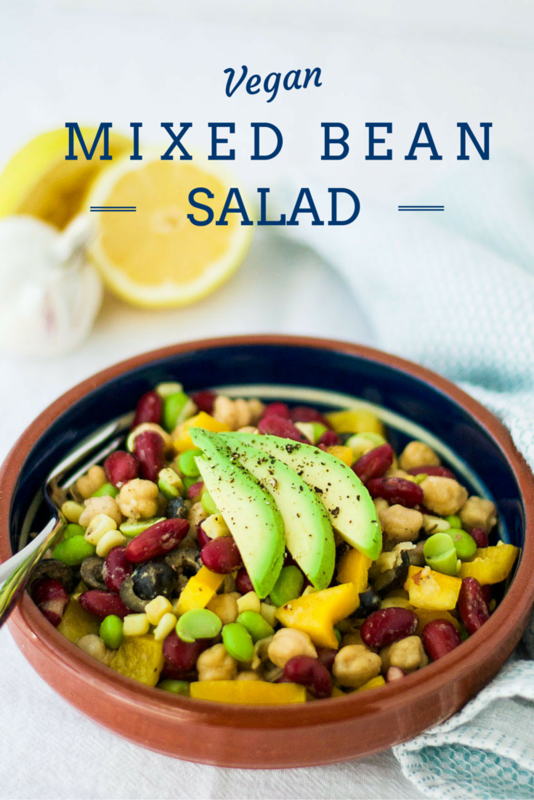 So in an effort to reach my daily quota of fiber (around 25 grams for a woman and 38 grams for a man), I made this delicious mixed bean salad. 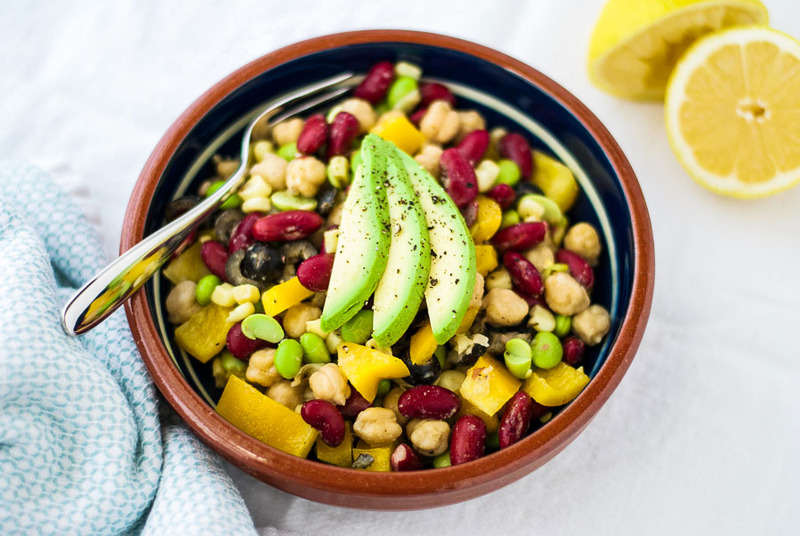 This salad contains a whole smorgasbord of tasty beans and other fiber-filled beauties. 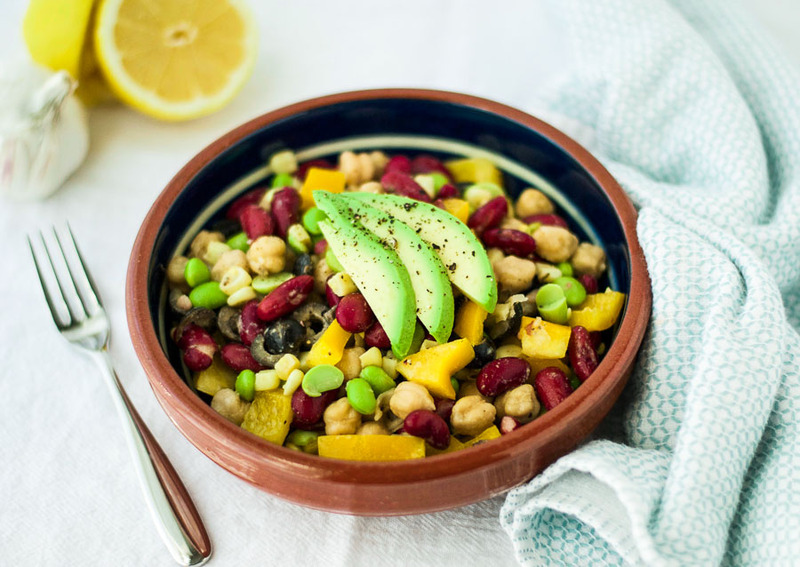 Just 1 cup of edamame provides 8 grams of fiber, 1 cup of kidney beans contains 9.5 grams, and 1 cup of garbanzo beans has a whopping 12.5 grams of fiber. However, I do have a word of warning. While I am all in favor of eating plenty of fiber, if this is something new to you, please take it slowly. A sudden increase in fiber intake can (and probably will) result in gastric distress. Not something I would wish upon anyone. Just a quick note about beans. In a perfect world I would buy dried beans, soak them, cook them, and use those fresh little babies for my bean salads. Unfortunately, however, my world is far from perfect (but a lot of fun nonetheless). If I had to make beans from scratch, I probably wouldn’t eat a lot of beans. Instead, I buy low sodium canned beans or, better still, beans in a carton. And if the low sodium is not available, I rinse them in cold water before eating them. However, if your life is more organized than mine, please go ahead and cook some dried beans for this recipe. 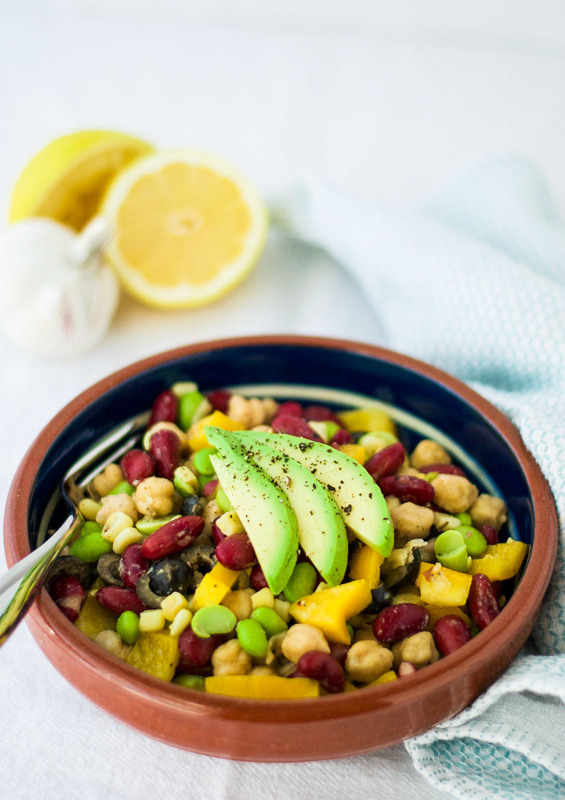 Put the beans, edamame, corn, olives, bell pepper, and salad onions in a large bowl. In a small bowl, whisk together the olive oil, vinegar, mustard, lemon juice, garlic, and salt and pepper to taste. Pour the dressing onto the salad and mix. Looks very tasty! Healthy too! You still can’t speak American?? Do you mean the garbanzo beans? They are chick peas. Was there anything else? when you say salad onions ,do you mean scallions. I AM MAKING A LARGE BATCH OF THIS SALAD . I AM MAKING A LUMCH FOR 30 PEOPLE. WITH MANY SALADS. .THIS LOOKS VERY GOOD. Hi Joyce. Yes I do mean scallions. Good luck with your lunch. I hope you enjoy the salad.